One of the best ways to identify employees to the general public is by the use of company shirts. For the safety of both the employees and the customers of your company, providing branded shirts for employees to wear when they are working ensures clear identification. New Jersey Resources did that recently with these t-shirts we printed for them. We put their logo on the front left chest and full back. You can print front, back, front AND back, and even sleeves. If you have partnerships with suppliers, consider seeing if you have co-op money to help with purchasing the shirts. You include their brand as well as your own on the shirts in return for use of those marketing dollars. It’s a win-win situation for both brands. 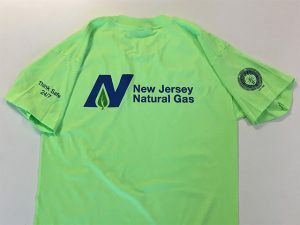 These NJ Resource t-shirts have partner logos on the right and left sleeves. When you are ordering t-shirts, you need to be aware that if you are working with specific PMS colors (Pantone Matching System colors), you may need to put a white underbase beneath the Pantone colors in order to ensure the PMS colors are correct after screen printing them. Many printers skip this step to make the shirts cheaper, but the end result is that the printed colors are not always right. 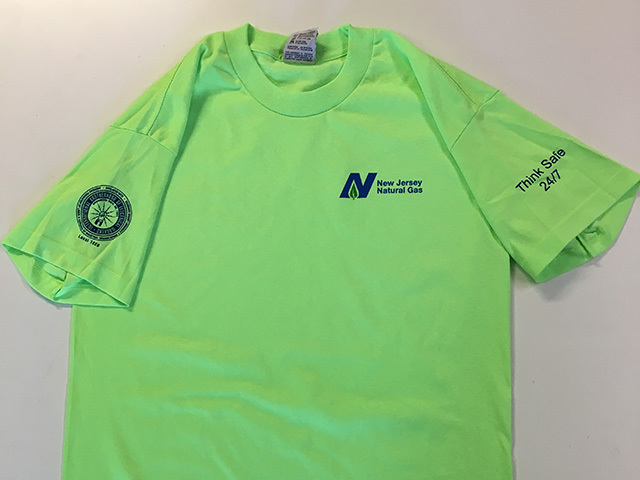 With these lime green shirts, we found we did need to put that white underbase beneath the blue and green inks to make them stay the right shades to match NJ Resource’s PMS colors. Want to brand your company employees? Contact Sandee HERE and she can help you choose the best shirts to logo for your company’s identification.